Winter is for decadent desserts. For caramel and eggnog and chocolate. Peppermint candies and cinnamon laced cookies and sweets dusted in powdered sugar. I have memories of going to my relatives houses for Christmas Eve all decked out in my fanciest velvet hair bow and sampling every different shaped butter cookie just to see if they tasted different (they didn't). And of watching my parents drink red wine and store-bought eggnog (a very exciting new thing at the time, I think). And the sweaters! And the perfectly coifed hairdo's! My family likes to get glamorous whenever possible, so I have a lot of memories of jewel-bedecked adults clasping tiny cups of sherry in front of the Christmas tree. It is most certainly not a time to skimp on the treats (or drinks). So one of the major reasons I developed this recipe = there are really very few decadent vegan, gluten free holiday cookie recipes on the internets. And even though I'm not vegan, I still feel like everyone should have the opportunity to pig out on glorious, wintery confections when the time comes. I've had various dietary restrictions over the years, and it's such a bummer to get invited to a cookie swap or a cocktail party (to which you're expected to bring something decidedly badass) and you really have no clue what to do. So, yes, the dulce de leche is basically a caramel that you have to baby for quite some time. But it's pretty damn impressive. And your vegan/gluten-free friends will thank you a la Wayne & Garth. I mean, it's a caramel cookie sandwich. Everyone will thank you. The best part might be that they don't taste or feel like they were made for folks with dietary restrictions. They just feel like cookies. Like really good, sugary, cinnamon-heavy caramel decadence. That's kind of the point. These grahams are admittedly still pretty wholesome. The flour blend is based in sorghum, almond meal, and rice mostly -- and the sweetener in the cookies is coconut sugar. The cookies come out crisp when cut out at 1/4 inches -- but they'll come out softer (if you're into that) if you cut them out closer to 1/2 inch each. The coconut dulce de leche sandwiched in between the thin grahams keeps the crisp grahams soft. They're arguable even better in the first few days after you've baked them and sandwiched them together. And of course it must be said that the dulce grahams and the grahams on their own are great dipped in coffee. Logan and I have been devouring them by the handful over breakfast. It's mainlining some Christmas spirit straight into our blood streams. Looking for more fabulous Christmas recipes (savory & sweet)? 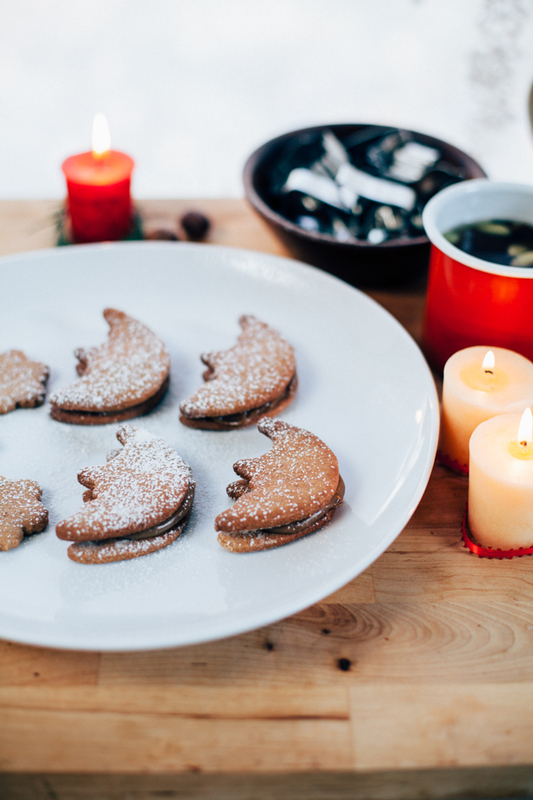 Check out Valentina's Vegan Holiday Cookie post on Hortus Natural Cuisine! She has a wonderful roundup towards the end of the post. Grahams liberally adapted from [url href="https://food52.com/blog/11530-how-to-make-moon-pies"]Dolly & Oatmeals Graham Cracker Cookies[/url]. Note: I used Native Forest brand full-fat coconut milk, which is very creamy and thick. Usually half to 3/4 of the can is straight up coconut cream. If you can’t get a very fatty or premium coconut milk, I suggest cooling your coconut milk in the refrigerator for an hour prior, so that the fat and water separate. Place a medium sauce pan over medium heat. Add the coconut milk and coconut sugar and stir to combine. Simmer for 2 hours until the dulce has reduced to 1/4 of its original volume and becomes a dark, caramel brown color. My dulce was cooking at 300F to 325F most of the time. The first 30 minutes you'll need to stir only occasionally. The longer it cooks and heats the more you'll need to stir it, scraping down the sides as you go. If you see the dulce boiling, reduce the heat to return it to a simmer. The last half hour you really have to baby it, stirring constantly. At the end of the process, the coco dulce will be boiling relatively rapidly -- remove from heat and, using a silicon spatula, transfer the dulce to a large, wide mouth mason jar (or the bowl of a heat safe blender like a Vitamix). When it's done the dulce will “break” i.e. the coconut oil separates from the milk. Don’t freak out. This is part of the process. [b]If using an emulsion blender,[/b] be sure the blending wand is fully submerged in the caramel which you've transferred to your mason jar. Blend until your caramel is creamy. [b]If using a heat-safe blender[/b], blend the caramel until smooth and creamy on high heat for 20-30 seconds until creamy. Carefully scrape the caramel into a heat-safe container. Cool for at least 2 hours. The caramel will thicken up significantly. Can be stored in an air tight container in the refrigerator for up to 2 weeks. Preheat the oven to 350F and line two large cookie sheets with parchment paper. To the bowl of a food processor fitted with an S blade, add your sorghum, white rice, almond, and tapioca flours, and your coconut sugar, baking powder, psyllium, salt, cinnamon, and nutmeg. Pulse to combine. Add one tablespoon at a time of coconut oil to the flours and pulse to combine after each tablespoon. The mixture will start to look sandy. Whisk together the almond milk and maple syrup in a small bowl. While the food processor is running, add the milk-maple mixture in a steady stream. The mix will start to form into a dry dough. Scrape down the sides, and process for 10 seconds more. At this point your dough will start to become pliable. Empty the dough out onto a piece of parchment paper. Remove from the fridge. Dust a parchment paper covered work surface with flour and roll the balls out, one at a time, to 1/4 inch thickness. Using a 1.5 inch cookie cutter, cut out your cookies and place them on your parchment paper lined baking sheets spaced about 1/4 inch apart. You can squish the extra dough back together and re-roll it out, dusted with flour, until you have about 60 cookies cut out. Gluten free cookie dough is forgiving like that. Bake each cookie sheet on the middle rack for 10-12 minutes, until the cookies turn a golden brown color. Remove from oven and let cool completely before handling (they firm up a bit). Once the cookies are completely cooled (and they have to be to spread the dulce de leche on! ), spread 1 teaspoon of dulce onto 30 of the cookies. Sandwich each of the cookies with a top cookie, pressing down gently to spread the dulce in the centers evenly. To store: cookies can be frozen in a tightly sealed container for up to two weeks (thaw at room temp for 30 minutes before attempting to eat them!) or in a sealed container in the fridge for up to a week. But I think they're best the day of and the day after.